Working for the local press brings all manner of challenges. And today I have been interviewing Mr Benn, Penzance Borough Meteorologist. And of course our topic – the topic that’s the talk of the town this week - is the weather. I know, I know. We have to do our best with the headlines. The glass yesterday was quite extraordinarily high – 30.82 recorded. That beats Falmouth at 30.78, I’m pleased to say, and isn’t very far off the British record of 31.11 – set, apparently, one January day in Aberdeen, back in 1902. But our 30.82 was sufficient to give us a quite perfect day. Seven hours of sunshine, a slight southerly breeze, and a flat calm. A tonic, I might say, at this time of year. So I was delighted, as you can imagine, to stroll down and interview Mr Benn this morning. The temperature had probably already today’s official high - 54.7°. He’s a venerable old chap, is Mr Benn, and remembered the month when that record was set in Aberdeen nearly 30 years ago: it was remarkable in Penzance, as well, he told me. Aberdeen may have set the record, but Penzance wasn’t far behind. After that, he told me, barometers had to be sent away and re-set, so that they would register 32 if called upon to do so. Well, we haven’t quite reached those heights this week. And Mr Benn, to be frank, didn’t give me much to work with, saying things like “it is an extraordinary thing, but nevertheless true, that the highest barometrical readings occur in winter” and “so far as the present fine weather is concerned, I think this is likely to continue for a day or two, at least”. You can see my problem. I mean I have to quote the gentleman, and to give him his due he does sound like an expert, but we’ll hardly be giving the Daily Mail a run for its money. But there’s more than one way to skin a cat, and later on I managed to find a few people to give me some jolly good quotes. How about this one: “If it goes much higher, it will boil over”. What an idea, madam. No, of course I didn’t make it up. And there’s a bit of mileage in the weather’s blown in direct from the USA, and so for once we can welcome what’s coming our way across the Atlantic, and so forth – that might just make the oldsters stop and think. We hear quite enough moaning from them about American this, that and the other: easy credit and where all that leads; films with titles like Madam Satan; soda fountains, etc, etc. So I’m hoping with this fine weather, all those Victorians will rummage around in their wardrobes, take their summer underclothing out of mothballs, and enjoy a game of beachball. Not all that fascinated by the weather, Sir? And perhaps unhappy with the tone I’m taking? Well, it’s a slow news day. I’ve done what I can. The On This Day team readily admits that November 13th has proved to be a very slow news day indeed. If you have a better story – perhaps a “Friday 13th” story, humorous or otherwise, please get in touch. 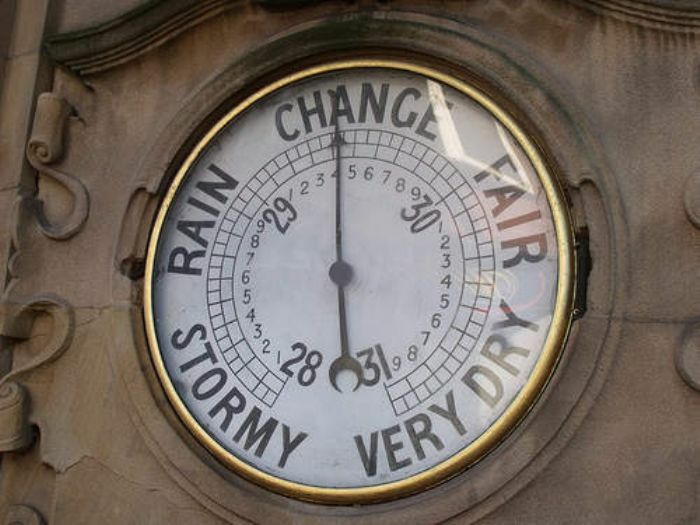 However, if you would like to know more about barometers, On This Day recommends http://www.artofmanliness.com/2015/07/07/fair-or-foul-how-to-use-a-barometer - suitable for readers of any gender.